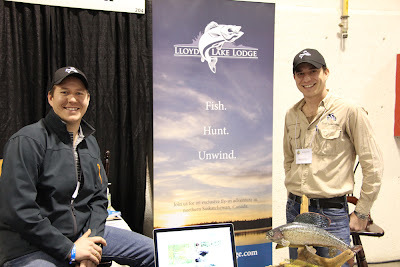 The Calgary Boat and Sportsmen’s Show was our first trade show ever. Of course we’d been to lots of shows before, but always on the customer side of the booth. Being on the other side was an awesome time. Derrick went down on Wednesday night to set up. Although it killed me, I stayed behind to finish up at my day job. While we had some minor drama with business cards not being printed on time, all was sorted out when show time hit on Thursday afternoon. For the week before Calgary, we were shaky with happiness, although it’s a tough feeling to describe. It was quite surreal to think about what we were actually doing. There we were, standing in our booth, faced with the cold, hard truth of owning a lodge and having to do something concrete about it. Luckily, it all came very naturally. Turns out it’s easy to sell a product when you’re speaking from the heart and honestly intend for each client to have the best trip possible. We know the fishing is awesome. We also know that by the time we’re through fine-tuning the accommodations, and Derrick is done in the kitchen, the lodge itself will match the great outdoors. An unexpected bonus was listening to other people’s stories. Standing in our booth wasn’t just about selling a fishing trip to people. In fact, having them share their fishing stories with us was one of the best parts. We should have expected it. Storytelling is a major part of being an angler (everyone’s caught “the big one,” right? ), but it wasn’t until we were actually listening to the funny, the sad, and even the seriously twisted stories that we realized how great that part of working a show is. We loved it all—from the couples who have been fishing together for 25 years to the dads seeing their sons’ eyes sparkle as they consider their first fly-in fishing trip together. At some point, I didn’t even want to sell trips anymore because talking with everyone brought back so many fond memories of fishing with my grandfather. It really brought home the reality that he’s gone. I have a new fishing partner, awesome memories to cherish of my first 25 years of fishing, and new ones to make for the next 25, but life is relentless and just keeps going whether you’re ready or not. It gives and takes away, sometimes at the same time. Not sure why I became a philosopher in the middle of the show, but there you have it. Calgary really sorted out that owning a lodge is not just about us. In the end, it’s about sharing stories with people, even those who may never come to Lloyd Lake. We all share that universal feeling of “I was there,” and that feeling never gets old. It buzzes through us each time we reflect on our once-in-a-lifetime trips. What a great privilege to steward a place that can create such powerful emotion.